in a couple of weeks, i've been spending a lot more time than usual (which is already more than some might consider normal) thinking about beans. beans, my favorite vegetable. ok, legume. but still, you know what i mean. (why are they so good?). since beans, eggs, yogurt and cheese are my go-to daily sources of protein, i'm okay with spending a bit more for the really good stuff. out of context, $6 or $7 for a dozen pastured eggs or half-pound of heirloom beans might seem exorbitant, but looking at an dinner built around vegetables, an artisan bread or whole grain, and some good beans and eggs tells a different version of the same story, one where a delicious, local, organic and balanced meal for four people can cost under ten dollars. here's the thing: non-heirloom dried beans are really, really good, too. for me, spending the extra money makes sense because it brings me joy to get to know (a.k.a. totally geek out on) all of the different types of beans out there, to see how pretty they are in jars on my shelves, and to watch them transform as they cook. i also try to know where my food comes from, and to support people doing good work, so a couple bucks on fancy heirloom beans is money i'm glad to spend. you can find great non-fancy beans at the market, too. but try to look for beans that aren't super old and withery, so if the bulk section at your local shop looks like it hasn't been perused in a couple of years, maybe skip the bean bin. the thing is, the fresher your dried beans, the more quickly and evenly they will cook, the creamier they'll be, and the better they will taste. i try to buy and use all of my dried beans within two years of harvest, and knowing the people who grew the beans in the first place helps me meet that goal. cover with water and soak overnight, or at least 4 hours. add an onion, some salt and any herbs you like. a splash of olive oil won't hurt. bring to a boil and reduce to a simmer until tender. this can take anywhere from 45 minutes to a couple of hours. skim any foam that appears. add water, if needed, to make sure they are always immersed. season and eat. or refry. or turn into soup, cassoulet, or any one of a million delicious things! though i don't have a crock pot, i think one might be ideal for bean cookery. i just use my old, rusty le creuset pot. aaron is obsessed with using clay pots for his beans, in an effort to bring a little bit of the old country to cedar street, i guess. really, anything will work. , or bean-eaters, the derogatory nickname for tuscans. 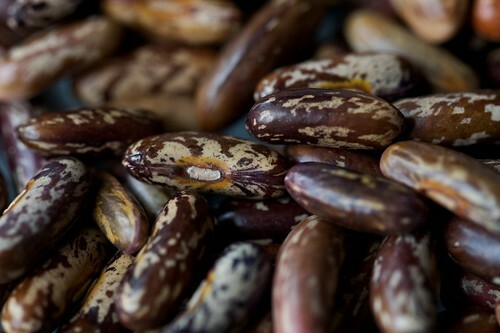 has bulk rancho gordo beans! wahoo!